The glutes are the powerhouse of the human body. They’re essential for running faster, jumping higher, throwing farther and lifting heavier. Therefore, it’s obvious that the gluteus maximus consists of a very high percentage of fast-twitch muscle fibers, right? Think again. The logical questions that follow are, does this information impact the way we best train the glutes, and if so, how? Unfortunately, there are no studies to my knowledge examining the effects of different forms of training on gluteal hypertrophy. Therefore, I’m going to rely on logic and anecdotes based on my experiences as a personal trainer in order to advise you. 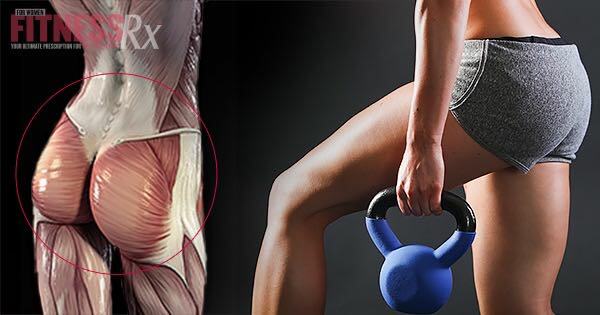 I believe that the fiber composition of the gluteus maximus indicates that we should train glutes via heavy low-rep training, moderate medium-rep training and light high-rep training. Lifting heavy weights leads to high levels of muscle activation. This is indicative of greater tension on the gluteus maximus, which is a primary driver of muscle hypertrophy. Therefore, if you go heavier on exercises such as squats and deadlifts, your glutes will attain an efficient stimulus for muscular growth. However, if this were all you did, you’d be leaving a lot of room on the table for increased gluteal shape. It is also important to keep in mind that lifting heavier loads is more risky. Since you won’t be able to build your glutes if you injure yourself, you need to make sure your form is really solid before jumping into heavier training. Lifting lighter weight for higher reps to failure also leads to high levels of muscle activation, though not quite as high as that of heavier weight.4 Moreover, lifting lighter weights to failure has been shown to lead to slightly greater hypertrophy in the slow-twitch muscle fibers compared to heavy weights.5 If you want to maximize gluteal hypertrophy, you cannot ignore the slow-twitch fibers, especially since they account for more than 50 percent of the total glute fibers. It is true that the slow-twitch fibers cannot grow as large as fast-twitch fibers, but that doesn’t mean that slow-twitch fiber growth is insignificant. In fact, it’s one big reason why bodybuilders are more muscular than powerlifters. Some exercises are simply better suited for medium or high reps. For example, lunges, hip thrusts, cable kickbacks, back extensions and various hip abduction exercises don’t lend themselves very well to a one-rep maximum lift. These exercises are best done in medium to higher rep ranges. You should regularly go all out using lighter loads for approximately 20-30 reps in your glute training, since this leads to high levels of metabolic stress in the glutes. Metabolic stress is another primary driver of muscle hypertrophy, so in addition to experiencing high levels of tension in the glutes, you should regularly feel the burn and achieve a glute pump in training. So how can you mix it all together and make sure you’re covering all of your bases? Just start with low-rep training, then move to medium-rep training, and finish off with high-rep training. Here’s an example training session: Begin with a 10-minute dynamic warm-up consisting of various drills that move the hips through a large range of motion and activate the glutes. For example, multi-directional lunges, side lying clams, walking knee hugs and bodyweight glute bridges. Next, warm up on squats and then perform three sets of six reps with the heaviest weight you can use with good form. Now switch to medium-rep barbell hip thrusts, performing three sets of 12 reps. To finish off the session, perform two sets of 20 reps of standing cable hip abductions and two sets of 20 reps of standing cable kickbacks. This session will have adequately stimulated the fast- and slow-twitch fibers in the upper and lower gluteus maximus. There are many effective exercises that you can employ, but make sure you’re progressively getting stronger in a variety of rep ranges over time. Sirca A, Susec-Michieli M. Selective type II fibre muscular atrophy in patients with osteoarthrits of the hip. Neurol Sci 1980; 44: 149 – 159. Johnson MA, Polgar J, Weightman D, Appelton D. Data on the distribution of fibre types in thirty-six human muscles. An autopsy study. J Neurol Sci 1973; 18:111–129. McAndrew D, Gorelick M, Brown JMM. Muscles within muscles: a mechanomyographic analysis of muscle segment contractile properties within human gluteus maximus. J Musculoskel Res 2006;10:23e35. Schoenfeld, B, Contreras, B, Willardson, J, Fontana, F, & Tiryaki-Sonmez, G. Muscle activation during low-versus high-load resistance training in well-trained men. Eur J Appl Physiol 2014; 114(12), 2491-2497. Mitchell, C, Churchward-Venne T, West D, Burd N, Breen L, Baker S, Phillips S. Resistance exercise load does not determine training-mediated hypertrophic gains in young men. J Appl Physiol 2012: 113, 71-77.